The Orionids (Orionid Meteor Shower) are an annual meteor shower that occurs between October 16 and October 27. The meteor shower peaks around October 21 with a zenithal hourly rate of 20 to 25 meteors. The exact dates vary from year to year, as does the hourly rate. The Orionids sometimes also have double peaks. The meteors typically reach a velocity of 66 kilometres (41 miles) per second. The radiant of the Orionid Meteor Shower, or the point the meteors appear to come from, is located just to the north of the bright star Betelgeuse in Orion constellation. It lies near the border with the constellation Gemini. When observed from mid-northern latitudes, the radiant is located in the south-eastern sky before sunrise. However, the Orionids can be seen shooting across a large area of the night sky and not just in the direction of Orion. The meteors are visible both from the northern and southern hemisphere. The Orionid meteor shower is the most prolific meteor shower produced by the comet 1P/Halley. 1P/Halley, better known as Halley’s Comet, is also associated with the Eta Aquariid meteor shower, which occurs in late April and early May every year. The radiant of the Eta Aquariids is located near the star Eta Aquarii in Aquarius constellation. Halley’s Comet was named after Edmund Halley, the astronomer who observed it in 1705 and discovered that three previous comets seemed to come back every 76 years. Halley was the first to suggest that the three comets may in fact be only one comet. 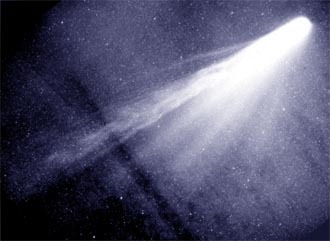 Halley’s Comet is the only short-period comet that can easily be seen without binoculars from Earth. It completes an orbit around the Sun every 75-76 years and it last passed through the inner solar system in 1986. It will next be visible from Earth in 2061. The comet has been in the solar system for more than 2,000 years and sightings have been reported since at least 240 BC. When Halley’s Comet passes near the inner planets, the Sun warms up some of its ice and, as a result, pieces of rock break away and continue on the comet’s trajectory. It is these particles that appear to us as meteors when they pass through Earth’s upper atmosphere as our planet passes through a stream of debris left behind by the comet. As the particles reach our atmosphere, they heat up and disintegrate, leaving colourful streaks across the sky. 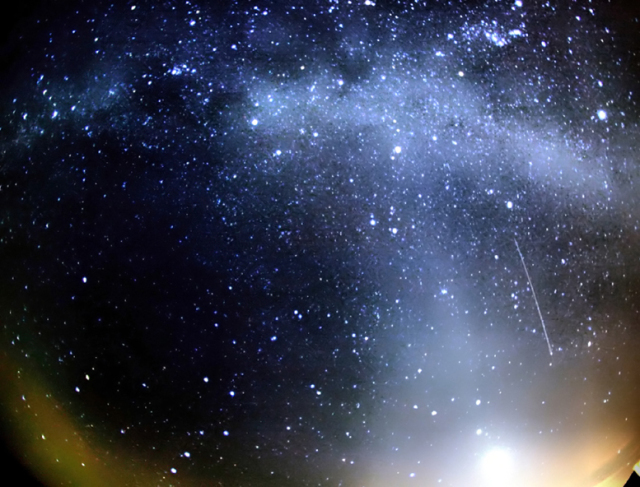 The Orionid meteor shower is best viewed between midnight and dawn. While meteors can be seen anywhere in the sky, astronomers suggest that observers in northern latitudes look in the direction of the south-eastern sky and those in southern latitudes look toward the north-eastern sky. The Orionids were discovered in October 1839. Edward C. Herrick observed and documented the activity in the October sky in 1839 and 1840. It was the English astronomer Alexander Stewart Herschel , son of John Herschel, who produced the first record that made it possible to make accurate forecasts for the next meteor shower. In October 1864, he spotted 14 meteors that appeared to radiate from Orion constellation. The following year, Herschel confirmed that the meteor shower indeed originated from a point in the direction of Orion. The dimensions of Halley’s Comet are 16x8x8 kilometres. It is one of the darkest, least reflecting objects found in our solar system. The Orionids’ activity date range changes slightly from year to year. In 1839, the meteors could be seen from October 8 to 15. In 1981, they were visible from October 18 to 21. In 2009, activity was documented between October 18 and 25. In 2012, the meteor shower occurred from October 2 to November 7, with peaks on October 20 and 23. In 2014, the meteors started shooting across the sky around October 2. The meteor shower is expected to last through the first week of November and peak around October 20 – 21. The Orionids should be easy to see both from northern and southern latitudes. The almost new Moon will not be too bright and the dark skies will make this year a favourable one for observing the meteor shower.